A digital to analogue converter takes a series of digital inputs (a string of 1s and 0s, in our case there will be 8 of them like 10011001) and converts it into an analogue output. You see DACs in every digital audio device (MP3 players, CD players) as these all store music in digital form, but need to drive a speaker with an analogue signal. Hence the need to convert the digital data into an analogue signal. Binary Numbers and BitsWe usually use Decimal numbers in our calculations. Computers use Binary numbers. Each binary number consists of a sequence of bits. These are 0s and 1s. A sequence of 8bits is called a Byte. In this experiment we will work with bytes. On a computer a $1$ is represented as a HIGH voltage (5V on the Arduino) and $0$ as a LOW voltage (0V on the Arduino, though on some systems all that may be necessary is a sufficiently low voltage. For more on binary numbers see the Wikipedia article. Cool fact: if you counted in binary using your fingers you’d be able to count from 0 to 1023. In our setup, we will use the Arduino Uno to set the digital pin values. This will be done in software. The DAC will be made of resistors in what is known as an R-2R network. You will find more information about R-2R networks on the links provided below. DAC description by Alexander Scheeline from the Department of Chemistry at the University of Illinois at Urbana-Champaign. Very good resource and worth reading. Explains how the ladder works as a complex voltabe divider. In particular, see the description of R-2R networks. The description given in the above article doesn’t directly apply to our circuit. Though you will see why it does work, if you’d like to dig more into our circuit have a look at this article which uses Thevenin’s Theorem to simplify a DAC similar to the one we use. I’ve placed a PDF file of this article here. RECOMMENDED: Here’s another good article by Alan Wolke on DACs and R-2R networks. I’ve placed a PDF file of this article here. This article explains in some detail how the R-2R network can be analysed and demonstrates how we obtain the output voltage of the DAC. Resistor Ladder from the Wikipedia. This is a shorter article. Why give you all these references?This is meant to be a real world experiment. You are guided through it, but you are not spoon-fed. The reasons why we do certain things in paritcular ways is sometimes found elsewhere. You should make an attempt to read the references, particularly the recommended one. In the first part of the experiment we will use 5% resistors in the DAC. Subsequently we will re-construct it using 1% resistors. The actual values of the resistors may vary. What is important is that one set of resistors has resistances twice the other. Here is a breadboard view of the DAC circuit. The second breadboard is included as we will place components here as the circuit develops. Also, there is a thin wire from one of the 20K resistors to ground. Ignore it. Click on the images for a larger view. We will first use 5% resistors to construct the DAC. Make sure you use these and not the more accurate, 1% varieties! The 5% resistors may be 10KOhm and 22KOhm. If so, the resulting network will not be exactly an R-2R network, but that is OK. You will see the point of using these 5% resistors below. These circuit diagrams have been made with the Fritzing program. You can access the Fritzing file for the DAC here. The Fritzing files (*.fzz) are editable. You can save these and edit them as you see fit. This could be useful for your own projects and for illustrating circuit diagrams for your report. But bear in mind that the edits are time-consuming so don’t try to do it during the lab! For details of Arduino sketches see the Arduino Getting Started page. If you haven’t already gone over the material and examples on that page, please do so before proceeding. Let’s look at what this sketch is up to. Recall that every Arduino sketch has a setup part and a loop part. The instructions in the setup part are exectuted only once, but the instructions in the loop part are executed till the device is switched off. but the former is clearly a lot more compact! where VALUE = HIGH or LOW. Question: What is the decimal value of the binary number 10110001? This is all very well, but how would you read out the result of the DAC? We have a few options: we could use a multimeter to do the reading (do it), or an oscilloscope, or use the Arduino itself. Let’s now explore the latter option. output of the DAC using the analogue pin A0 of the Arduino Uno. The analogue pins are Analogue to Digital converters (ADC). Set up the circuit to read the DAC output on A0 and run this code. You will need to start the serial monitor to see the output of the code. The serial monitor may not start till you hit a key. After that you will see a string of numbers. They will fluctuate slightly. Task:Question: Does the output at A0 correspond to the decimal value of the 8-bit input to the DAC? In the example above, we input the byte 10110001 to our 8-bit DAC. Earlier you were asked to figure out the decimal value of this byte. Does the reading on the serial port correspond to this value? If not, why not? Hint: Our DAC has an 8 bit output while the ADC on the Arduino is a 10 bit converter. You may need to do a bit of scaling to get the expected value. Task:Measure the output voltage of the DAC using a DMM (Digital Multimeter). Supply the DAC with 10 input values spanning the range of possible inputs (i.e., from 00000000 to 11111111). Record the DAC output voltage for each of these inputs. Task:Now re-construct your DAC using the more accurate 1% resistors. Task:Repeat the 10 measurements using identical inputs. Record the DAC output voltages. Task:Using the above formula, find the theoretical DAC voltages for your 10 sets of binary inputs. Compare these values with the two sets of results obtained above. Which set is closer to the theoretical values? Why do you think this might be the case? The following explanation of PORTD has been lifted verbatim from |Amanda’s article. This would work, but to generate a sine wave we would need a lot of bytes of data (the more, the smoother the waveform). Clearly this approach to sending data to the DAC is of limited value. Can you see how this works? It is shorter, and could have made it even shorter by using a function call. But there is an even simpler way of transmitting bytes to our DAC: The Arduino allows us to write an entire byte to pins 0 to 7 via PORTD. This is clearly a much better option! The code is shorter and also more readable. We can see the bytes we are writing to the DAC. 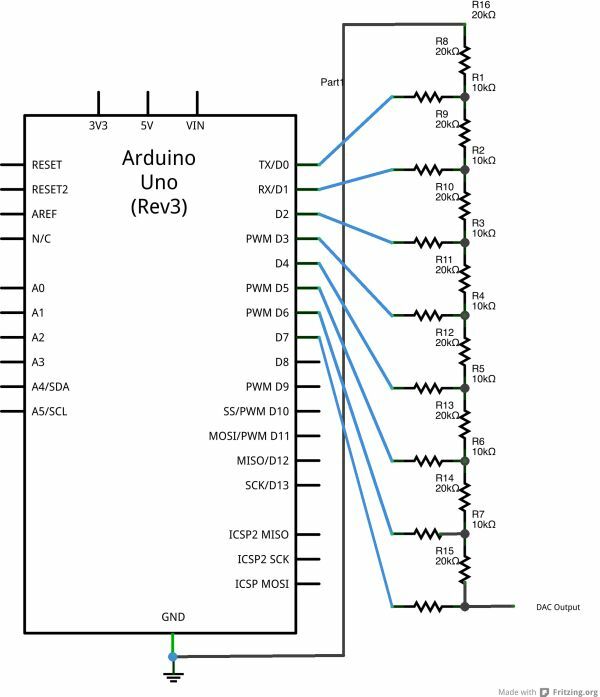 Additionally, the Arduino Atmel328 chip is able to write to all eight pins simultaneously and not sequently as was done when we used the digitalWrite() commands. Since PORTD has 8 pins on it (digital pins 0-7) we can send it one of $2^8 = 256$ possible values ($0-255$) to control the pins. This is called addressing the port directly. On the Arduino, digital pins 0-7 are all on port D of the Atmel328 chip. The PORTD command lets us tells pins 0-7 to go HIGH or LOW in one line (instead of having to use digitalWrite() eight times). 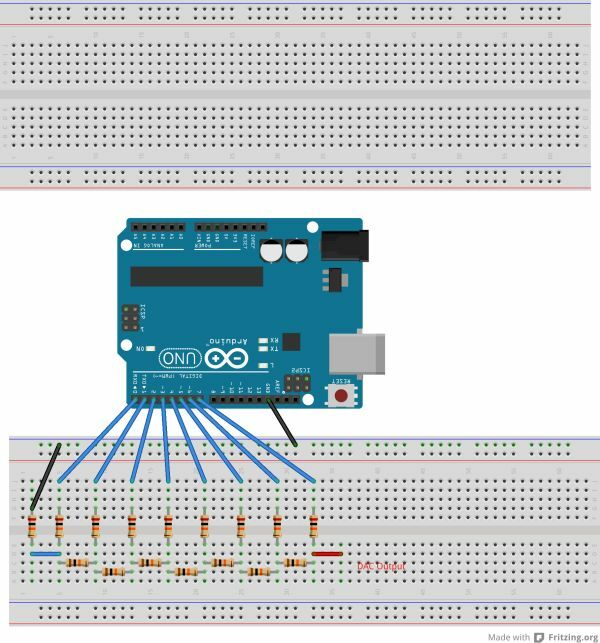 Not only is this easier to code, it’s much faster for the Arduino to process and it causes the pins to all change simultaneously instead of one by one (you can only talk to one pin at a time with digitalWrite()).